Abstract: This paper presents the Lower Triassic sequence in the Bükk Mountains (NE Hungary). On the basis of the revised macrofossil-collections and previous conodont studies, a biostratigraphic correlation and a chronostratigraphic subdivision of the formations and members is given. Hindeodus parvus (Kozur et Pjatakova), Isarcicella isarcica (Hukriede), Claraia aurita (Hauer), Eumorphotis gr. multiformis (Bittner), Eumorphotis cf. hinnitidea (Bittner), Costatoria subrotunda (Bittner), Eumorphotis kittli (Bittner), Tirolites illyricus Mojsisovics, Tirolites seminudus Mojsisovics, Costatoria costata (Zenker), Rectocornuspira kalhori Brönnimann, Zaninetti et Bozorgnia, Cyclogyra? mahajeri Brönnimann, Zaninetti et Bozorgnia, and Meandrospira pusilla (Ho) are the main index fossils. Two sections, which represent the entire Lower Triassic succession, were studied from a sedimentological point of view. These are the Gerennavar section for the Gerennavar Limestone Formation, and the Lillafüred section for the Ablakoskővölgy Formation, respectively. The sedimentological data and facies interpretations are summarized in facies models. During Early Triassic time the depositional area of the Bükk Mountains were situated in the epeiric shelf of the Western Tethys. The model of the Gerennavar Limestone Formation reflects the high-energy, tide- and wave-dominated shallow shelf, characterized by a protected–stabilized muddy sand flat and a high-energy sand belt. The model of the siliciclastic, lower part of the Ablakoskővölgy Formation indicates a mixed, dominantly siliciclastic shallow shelf with deposition in the coastal, shoreface and transitional zones. The model of the carbonate, upper part of the Ablakoskővölgy Formation refers a storm-controlled shelf with facies representing the whole spectrum from the peritidal–shallow shoals to the low-energy deeper subtidal zone below the storm wave-base. Lithologic and facies comparison of the Lower Triassic succession of the Bükk Mountains to other sequences of the Western Tethyan depositional area reveals many differences, and fewer similarities, which suggests local controls on depositions, that is locally different terrigenous siliciclastic input, different subsidence rate, antecedent topography, and dominance of the local physical regime. Abstract: Detailed microfacies analysis of Tithonian pelagic carbonate sequences from the Central West Carpathian and Pieniny Klippen Belt areas allows us to recognize several differences in chitinoidellid morphology on the basis of which several chitinoidellid genera — Chitinoidella Doben, 1963; Borziella Pop, 1997; Carpathella Pop, 1998a; Longicollaria Pop, 1997; Daciella Pop, 1998a; and Dobeniella Pop, 1997 could be recognized among the Middle Tithonian chitinoidellids of the Dobeni and Boneti Subzones. The new Popiella n.gen. was introduced, and in the framework of it, the new Popiella oblongata n.sp. was described. On the basis of the chitinoidellid vertical distribution, they were included into the Dobeni and the Boneti Subzones of the standard Chitinoidella Zone where they can be utilized for High Resolution Stratigraphy (HIRES) of the Middle Tithonian carbonate pelagic sequences. From the point of view of chitinoidellid phylogeny, this paper regards Longicollaria dobeni as the ancestor of Dobeniella and Crassicollaria species; Dobeniella tithonica could have been the ancestor of Remaniella ferasini. The newly described Popiella oblongata could have been in phylogenetic lineage with Calpionellopsis simplex and Calpionellopsis oblonga. Abstract: Calcareous nannoplankton was studied at the Eggenburgian holostratotype and faciostratotypes of Loibersdorf, Achberg, Brunnstube, "Judenfriedhof", Burgschleinitz, Fels am Walgram, Vadovce, Podkylava, Sverepec, Velka Causa and Lipovany. As sections with rich shallow-water molluscan fauna were chosen for Eggenburgian type sections, most of the samples are not favourable for the analysis of calcareous nannoplankton. Of 51 samples, 28 samples contain common to abundant calcareous nannoplankton which can be quantitatively analysed. Three bioevents were searched for in the type sections: FAD of Discoaster druggii (NN1/NN2 boundary), FAD of Helicosphaera ampliaperta (middle part of NN2 Zone, approximately Egerian/Eggenburgian boundary sensu Rögl 1998), FAD of Sphenolithus belemnos (NN2/NN3 boundary, upper part of the Eggenburgian). In areas with continuous sedimentation from the Egerian to Eggenburgian (the Outer Western Carpathians: Waschberg, Pouzdrany and Zdanice Units and the remnant flysch trough of the Skole-Skiba Zone; the Inner Western Carpathians: the Filakovo (Petervasara) Basin, all three events are successively observed while in areas with transgressive Eggenburgian sediments (Lower Austria, the Vienna Basin, the Danube Basin, the Vah River Valley and Horna Nitra Basin), sequences started with FAD of Helicosphaera ampliaperta. Two types of autochthonous assemblages were distinguished by multivariate statistical analysis (cluster and factor analysis): (1) abundant, dominated by Coccolithus pelagicus, (2) rare, dominated by reticulofenestrids. The third type of assemblage is dominated by reworked Cretaceous species. 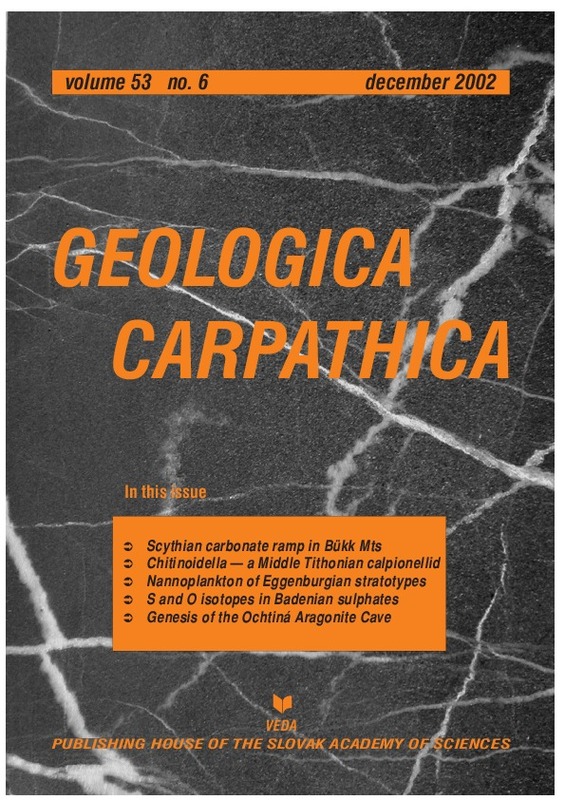 Abstract: A study of 333 samples from eight sulphate sections of the Badenian (Middle Miocene) from the marginal part of the Carpathian Foredeep basin and one section from its central part proved that the isotopic compositions of both oxygen and sulphur show a similar trend of evolution throughout the sections. In some cases, in the lower part of gypsum sections a gradual decrease of δ34S and δ18O is observed. In turn, the upper part of the section shows fluctuations of quite high amplitude, but within a clearly defined interval. The variation of δ18O values in the whole area is similar to that of δ34S values although in particular facies the variation ranges are different. Clastic gypsum shows the greatest spread of δ34S and δ18O values. 39 % of all δ34S values and 46.5 % of all δ18O values are higher than those characteristic for the marine sulphate values, and these higher values are mostly characteristic for clastic gypsum. Selenitic gypsum shows relatively narrow ranges of δ34S and δ18O values and hence is especially useful for analyses of depositional conditions. The isotopic composition of Badenian sulphates reflects the marine origin of brines. The recorded great spread of δ34S and δ18O values in the Badenian sulphates is related to the recycling of previously formed evaporites already during gypsum precipitation in the Carpathian Foredeep basin. Abstract: Ochtina Aragonite Cave is a 300 m long cryptokarstic cavity with simple linear sections linked to a geometrically irregular spongework labyrinth. The metalimestones, partly metasomatically altered to ankerite and siderite, occur as isolated lenses in insoluble rocks. Oxygen-enriched meteoric water seeping along the faults caused siderite/ankerite weathering and transformation to ochres that were later removed by mechanical erosion. Corrosion was enhanced by sulphide weathering of gangue minerals and by carbon dioxide released from decomposition of siderite/ankerite. The initial phreatic speleogens, older than 780 ka, were created by dissolution in density-derived convectional cellular circulation conditions of very slow flow. Thermohaline convection cells operating in the flooded cave might also have influenced its morphology. Later vadose corrosional events have altered the original form to a large extent. Water levels have fluctuated many times during its history as the cave filled during wet periods and then slowly drained. Mn-rich loams with Ni-bearing asbolane and birnessite were formed by microbial precipitation in the ponds remaining after the floods. Allophane was produced in the acidic environment of sulphide weathering. La-Nd-phosphate and REE enriched Mn-oxide precipitated on geochemical barriers in the asbolane layers. Ochres containing about 50 wt. % of water influence the cave microclimate and the precipitation of secondary aragonite. An oldest aragonite generation is preserved as corroded relics in ceiling niches truncated by corrosional bevels. Thermal ionisation mass spectrometry and alpha counting U series dating has yielded ages of about 500–450 and 138–121 ka, indicating that there have been several episodes of deposition, occurring during Quaternary warm periods (Elsterian 1/2, Eemian). Spiral and acicular forms representing a second generation began to be deposited in Late Glacial (14 ka — Alleröd) times. The youngest aragonite, frostwork, continues to be deposited today. Both of the younger generations have similar isotopic compositions, indicating that they originated in conditions very similar, or identical, to those found at present in the cave.